​​1910 - Alan Armstrong is born. ​1922 - 14-year-old Alan first designs his gyrosub. ​1932 - 22-year-old Alan begins designing weapons for the Secret Intelligence Service. ​1936 - 26-year-old Alan becomes an active duty field agent. ​1938 - 28-year-old Alan invents his Spy-Smasher identity, using his own inventions & gyrosub. 1943 - 33-year-old Alan is killed in action. 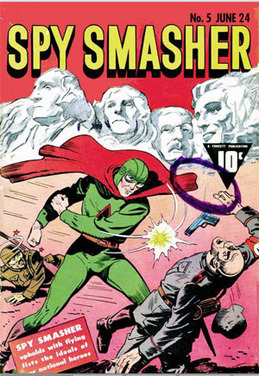 Spy-Smasher was one of the most popular characters of Fawcett Comics, along with Captain Marvel. He was even the star of a 12-part film serial from 1942. He's pretty much the epitome of wartime adventure characters; an amalgam of Indiana Jones, James Bond, and Batman. 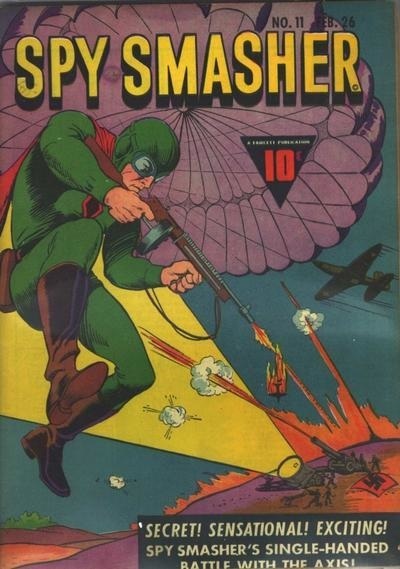 Spy-Smasher was acquired by DC along with the rest of Fawcett. He was going by Crime-Smasher at the time, as it was no longer wartime, and he was placed in the Earth-S part of the Multiverse along with his Fawcett counterparts. A new Spy-Smasher character was introduced in Gail Simone's Birds of Prey, and it established that Alan was a known hero of World War II, exactly as he should be.